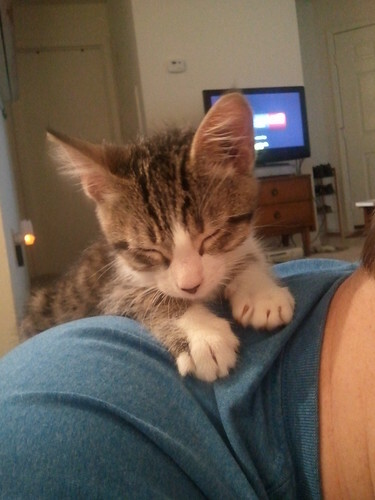 So I've had a kitten [which we named Ares, kitten of war!] for just about 24 hours. 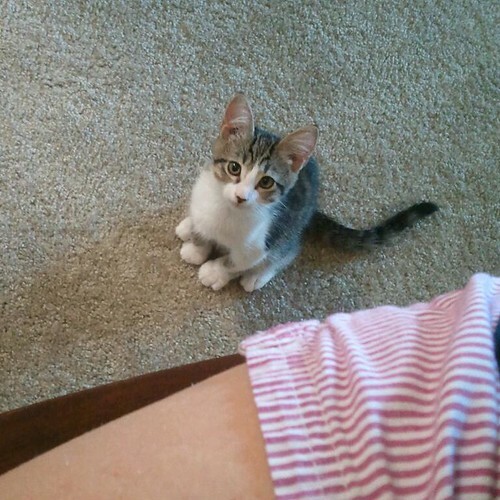 It's hard to sit on the couch and read blogs when your kitten wants to play. All.the.time. Even harder is figuring out when I'm going to sew! We took him in the sewing/airsoft room and let him wander around yesterday, but there's so many small things and spaces he can climb into that we keep the door closed for now until he mellows out. I'm not sure that I can sew and keep an eye on where he's wandering to in the room [those of you who sew with tiny children underfoot are clearly amazing]. I managed to piece this pillow top on Monday night since I figured I'd be too busy on Tuesday after picking Ares up at the vet. 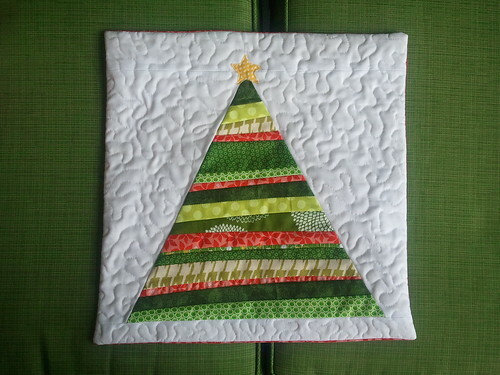 I woke up early this morning to sneak into the sewing room to quilt and finish it with an envelope closure. I would work for 10-15 minutes and then go play with Ares. It took a little bit longer to finish that way, but then I didn't feel bad for not giving him enough interaction. This pillow cover is destined for The Sewing Studio, which is the store I teach at, for a class in September. It's based off the pillow by Kati over at From the Blue Chair, although I don't use her tutorial whenever I make one. 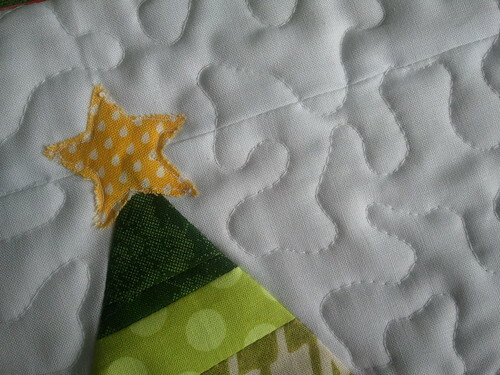 And mine is not paper pieced, because that just seems to make things a little more complicated than needed. I also like my original version [above] better, so apparently I'm more a fan of a skinny tree? 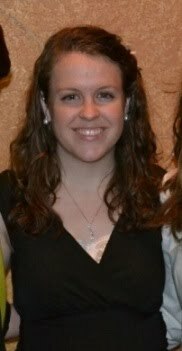 I'd like to get a bunch of DWR arcs sewn up today, because Jennifer is making me look super bad with all her progress. I cannot find my 8 arcs after we did a huge cleaning and kitten-proofed the apartment...I'm a little concerned Stephen might have thrown them out, thinking they were some sort of scrap project with the paper still on the back of them. Eeek! Here's to hoping the kitten allows it! Awww, what a cute fuzzy friend! I keep thinking I would like to get a kitten, but then I realize all of the shenanigans that it would get into at my apartment when I am at school all day. 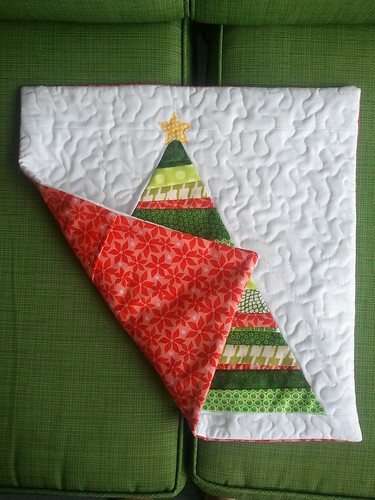 I love that pillow and have many intentions of making one or two of them for Christmas! Oh no! Haha Since moving in with my Steve he has learned not to touch ANYTHING sewing related, he's like a child, sticky, dirty fingers, moving things and forgetting where.. Haha the kitten is adorable!! wow he's an adorable kitten! I can't imagine what that's like though, I've never had cats. Maybe he'll grow out of it or calm down with age? 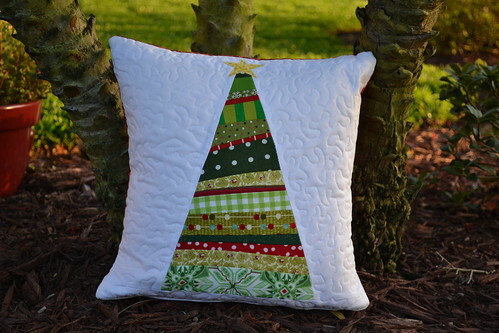 Love the pillow, great Christmas design! kitten!! so cute and love the name too. it's so hard to not play with kittens all the time because they have so much energy. enjoy!